When I was a kid and someone gave my family a box of chocolates, I would take a bite out of every single chocolate in the box and then put them all back like I hadn’t touched them. At some point, I’d get caught but the thrill of stealing sweet bites of chocolate was always worth the few minutes that I would spend in time out (besides, I always managed to find a way out of being in my parents’ bad graces). This story should tell you two things about me: 1. I’m sneaky and 2. I have a major sweet tooth. These two traits of mine are what prompted me to come up with this date syrup… during my sugar detox. Yes, I know dates are naturally high in sugar but they’re also high in fiber and nutrients, making them a better choice when it comes to sweeteners. 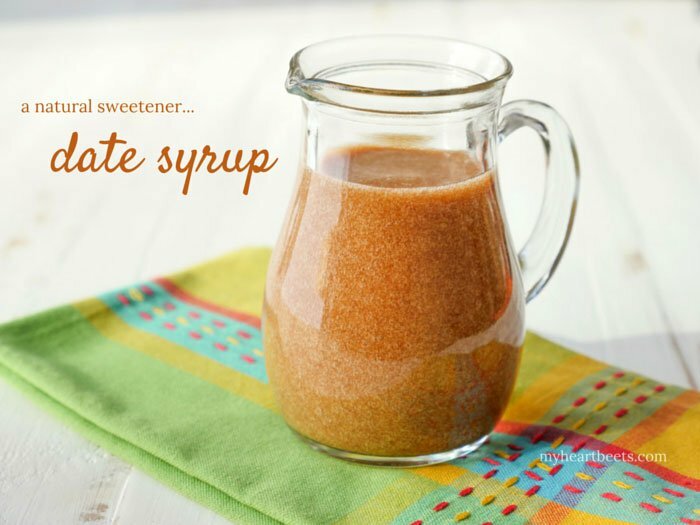 Date syrup has a sweet caramel and brown sugar-like flavor to it. 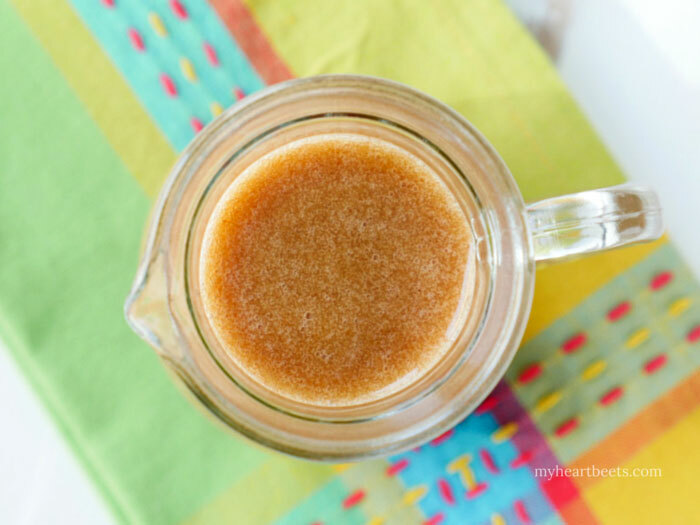 You can use it the same way you use maple syrup: to sweeten your coffee, on top of waffles, yogurt, etc. I’ve been using it to sweeten my morning decaf latte. The difference between my date syrup and other recipes out there is that mine uses the whole date. Some people will boil dates in water and then strain them out to make a clear date syrup. This takes a lot of time (at least 30 minutes) and effort. I just soak dates in water overnight, and then blend the mixture using a high powered blender the next day. This way, I’m keeping the fiber in the syrup. Technically, my date syrup is more of a date puree, but with a good blender you can get the date mixture to be nice and thin. You can also add more or less water according to your taste. 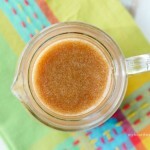 What do you plan to do with your date syrup once you make it? Add the pitted dates to a bowl and pour the water on top. Soak overnight. The next day, add all of the contents to a high powered blender and blend for 1 minute or until completely smooth. Store in an air-tight container in the fridge for up to 1 week. You can use more or less water, according to taste. Thank you for hosting Judee and these recipes. I will also go over to her site to thank her personally as well. I made the mango yogurt sorbet the day before yesterday. A small change I made was to use ground liquified dates as my sweetener (a date “syrup” I learned from “My Heart Beets” — so I guess I should thank that site as well). The whole thing was so delicious and refreshing and indulgent and EASY. Thank you to ***everyone***. what is the difference between a date syrup and a date paste? AND only medjool dates? Thank you.